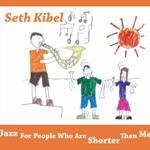 "Jazz for People Who Are Shorter Than Me" promises Seth Kibel in the title of his album. 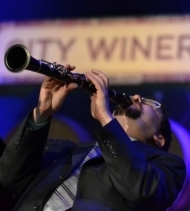 Seth Kibel is on his home turf (Washington/Baltimore region) a popular jazz, klezmer and swing musician, playing saxophone, clarinet and flute. This is one of those "one-off" childrens CDs that seems to be currently also quite trendy amongst "mainstream" folk musicians. The idea of jazzy versions of traditional songs for children is a nice one, so can this album deliver? Well, the songs that they know well ("Twinkle Twinkle"; "Down by the Bay", and particularly "Row, Row, Row your boat") go down quite well with my daughters - but I have to say that the jazz versions of some of them do not always work that well for me. Then there are - at least on this side of the Atlantic - lesser known as well as new songs. And finally, a number of decent jazz tunes which are good tunes but are not particularly distinctive as music for children. I find that the kids only want to listen to those songs they know, and the rest is for them a "take it or leave it". For me, of course, certainly miles better than listening to the "Frozen" soundtrack - but I am not fully convinced if it meets the objective of an album of jazz music for kids. 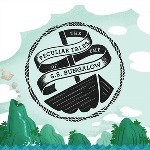 This EP is a musical sampling of the magic that is to come with the soon to be released album The Peculiar Tales of the S.S. Bungalow. If you are itching for some sea-faring folk music that will inspire imagination, wonder and a good deal of foot tapping, this album is for you. Come along and join us on the maiden voyage of the S.S. Bungalow! Download the EP @ NoiseTrade! Photo Credits: (1) Seth Kibel, (2)-(3) CD Cover (from website).